When Moses was a young man he ran away from Egypt. Why? Personal from Herbert W Armstrong - ONCE AGAIN, you are holding an enlarged, improved PLAIN TRUTH in your hands. This time, four more pages have been added, with - at last, after 29 years - a heavier full magazine-weight cover! While the next, or February, number will be the 29th anniversary of The PLALN TRUTH, this present number comes at the time of the 29th anniversary of the WORLD TOMORROW program, and of this Work of God. And so this 52-page heavier-cover edition is out 29th anniversary gift to you. 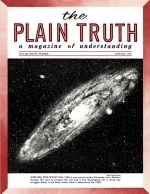 With the June, 1961 issue, I revived this personal talk in The PLAIN TRUTH - then called "Heart to heart Talk with the Editor" - after an absence of a few years. With that number we went up from 32 to 40 pages. In my personal talk with our readers at that time, I took our readers behind the scenes, and into various editorial, production, and mailing offices, to show you how this magazine is produced today. There were pictures of 23 of our editors and Staff officials.